Tengku Sir Ibrahim IV ibni Al-marhum Sultan Mohamed IV (1897–1960), wearing the tengkolok with the distinctive 'blooming flower' top unique to Kelantan, and his neck badge of the KCMG (Knight Commander of the Order of Saint Michael and Saint George). The Jawi script blends beautifully with the rectangular frames, both script and frames being of similar stroke thickness. Printing, withdrawal and invalidation dates and varieties of the Kelantan issue are detailed by Reeves & Dexter (1992). 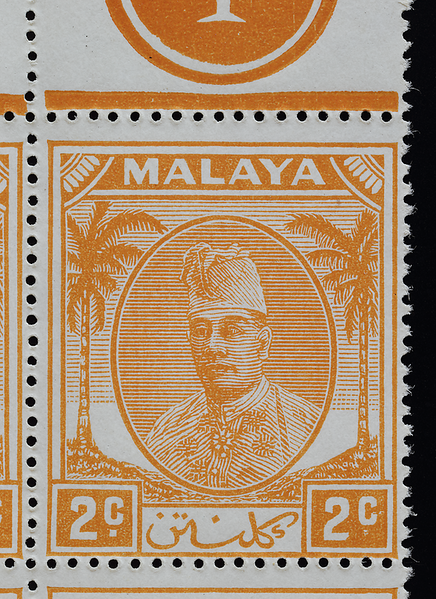 The new 50 cents colour scheme (above), making it look less special than it used to on the green paper, had its origins in pre-war Malay state stamps but appeared on the coconut definitive only after the war. The well-known "tiny stop" or "stop omitted" below the right-side "c" on the second stamp in the first row on plate 1 (Stanway 2009). 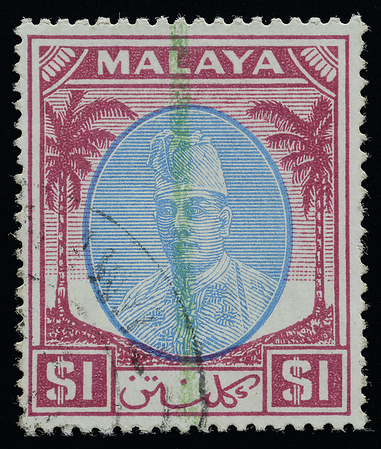 A similar flaw occurs in the 1935 Negri Sembilan 6 cents (Hooper 1992). But there is more to the Kelantan flaw than meets the eye. The tiny stop on the 2 cents is actually just one of four defects scattered across the tablet like blast shrapnel; even more interestingly, they may have different causes. While the tiny stop and the clipped corner of "2" could have resulted from dirt stuck in the plate, the "tentacle" protruding from "c" and the "horseshoe" to its right represent depressions in the plate that may have been caused by impact from a foreign object. 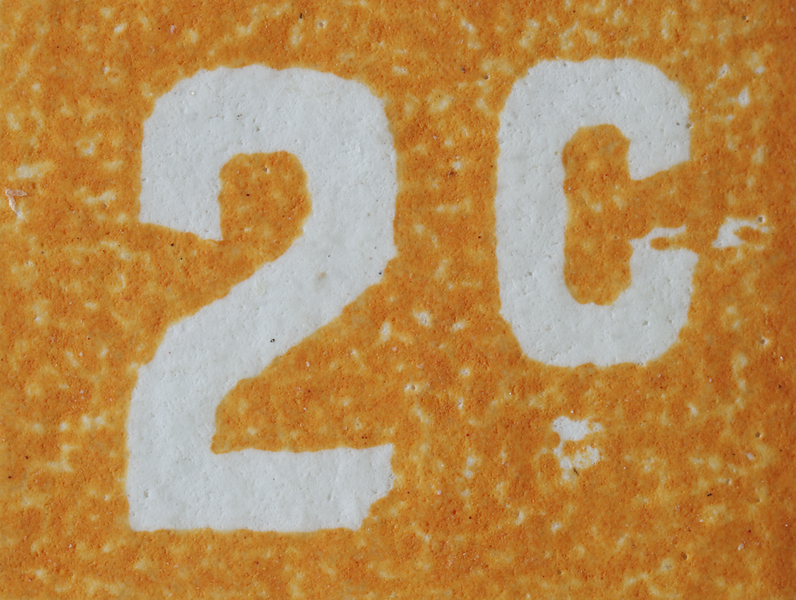 Alternatively, the defects on the stop and "2" could have originated from impact "craters" on the soft electrotyping mould that were transferred to the finished plate where they now became part of the printing surface. But you'd've thought that the odds of four independent defects occuring on a single stamp within micrometers of one another were close to nil. The author hereby proposes a "transplantation hypothesis": that fragments of the soft mould (a bit of the stop and the corner of "2") somehow came loose, migrated through the electrolyte and became attached to the other parts of the mould ("c" and the area to its right).